Here they come again. A new website launched by some operatives in the left wing of The Lutheran Church—Missouri Synod, with the gimmicky name Imagine Immeasurably More, has begun politicking in preparation for the 2019 convention of the Synod next summer. One of our new Gottesdienst bloggers has already provided a brilliant and necessary confessional response to it that is worth reading: “Let the Games Begin!” by Pastor John Bussman, was posted October 10, 2018. Bussman’s analysis is spot-on. This stuff is wearying, and we’re tired of it. (1) We’re tired of the political games. (2) We’re tired of so many parading around practicing as evangelicals only dressed up as Lutherans. (3) We’re tired of being told that Word and Sacrament ministry is secondary to neighborhood meet and greets because mission is all that matters and that the church is going to die. (4) We’re tired of being told that being uniquely Lutheran is offensive and narrow-minded. (5) We’re tired of the Divine Liturgy being watered down or even completely replaced for moralistic, therapeutic deism. (6) We’re tired of altars unfaithfully being left open. (7) We’re tired of pastors unfaithfully remaining on the roster only for their insurance and pension thus setting up men who are recently graduated from seminary for failure or burnout. Years ago the group was called Jesus First, and they blathered on with the exact same complaints. I am making a sweeping assumption here that this is the same group, because of this very thing, that they rehearse the very same canards. 3. We pray for and imagine a church in which congregations freely carry on their mission without the hindrance and control of church hierarchy. We repent of the obstacles we have placed in the way of congregational and district mission by the Synod’s restrictive policies. A growing centralization of power in the Synod has led to controls being placed on its members required by neither the Scriptures nor our founders. Uniformity in practice seems to be a higher value than Christian freedom. Congregations seem to be asked to serve the needs of a centralized Synod rather than Synod serving the needs of congregations. We pray for a church in which congregations worship and witness in the encouraging context of Christian freedom. In the first place, as Pastor Bussman has aptly pointed out, it’s unclear here who the “we” are who are doing the repenting. I find this more annoying than unclear. They are repenting on behalf of whom, exactly? Us? What gives them the right? And the “growing centralization of power” is, truth be told, a willful forgetting of a rather astronomical shift of power to District Presidents that took place when the Kieschnick administration drastically altered the structure of the Synod. But what they must have in mind is some (imagined?) sense of bureaucratic growth under the current (Harrison) administration. But what really alarms us at Gottesdienst is this disdain for “[u]niformity in practice.” Are they saying that President Harrison is actually pushing for it? Ah, would that it were so! Not so long ago a report began floating around that Gottesdienst has had an increasing “choke hold” on the Missouri Synod since 2010. If only! Then the complaints of Imagine would make more sense. I’m inclined to holler: Hey, you over there! We’re the ones who are pushing for uniformity in worship practices, not the synodical administration! We! Hey! Over here! You’re shooting at the wrong target! And we most certainly do not repent of it. On the contrary, we wish to see more of it, as we have learned from the best of our own teachers, because it aids the poor people and keeps them from confusion. [Y]oung and simple people must be taught by uniform, settled texts and forms, otherwise they easily become confused when the teacher to-day teaches them thus, and in a year some other way, as if he wished to make improvements, and thus all effort and labor is lost” (Preface of Dr. Martin Luther, Small Catechism, Trigl, 533). [T]he Lutheran liturgy distinguishes Lutheran worship from the worship of other churches to such an extent that the houses of worship of the latter look like mere lecture halls in which the hearers are only addressed and instructed, while our churches are in truth houses of prayer in which Christians serve the great God publicly before the world…. But what Imagine wants is actually more than simply freedom to worship in a certain way. We’d argue that even that much freedom is suspect, and reading carefully one can note here that what they want is more than liturgical freedom, as they pray for “a church in which congregations worship and witness in the encouraging context of Christian freedom.” Just what sort of freedom is being sought is open to anyone’s interpretation, but it is not anything resembling the faithfulness indicated by ordination vows to teach nothing contrary to the Lutheran Confessions. It is, put simply, a false freedom that is not faithful. 2. We pray for and imagine a church driven by a mutual confidence in Scripture alone as the sole authority for our teaching and confession. We repent of the elevation of our Lutheran confessional documents and convention resolutions to an authority equal to that of Holy Scripture. While we subscribe wholeheartedly to the Confessions as a true exhibition of Scriptural truth, we are alarmed at the neglect of Biblical study. In a time of growing Biblical illiteracy, many of our churches have no youth or adult Bible study. An emphasis on Lutheran identity coupled with a relentless quoting of Luther and Walther have left many of us hungry for a dynamic teaching of the inspired Scriptures. Here’s a good example of a straw man argument. For we know of no one performing this act of elevation of the Confessions above the Scriptures, and the context of the “repentance” indicates that it obviously isn’t Imagine who is doing it. So who is? Evidently if anyone should insist that Lutherans worship like Lutherans (such as Walther, see above), he would be guilty. And we know of no one who is not having Bible studies in his church. Isn’t everyone doing that, even the most outrageous of heretics? But the Confessions do matter, these documents to which they say they “subscribe wholeheartedly” (one would like to see the term “unconditionally”), because they are the documents we have all agreed to as the teachings of our churches. There is a great temptation to think Christian freedom could mean freedom to ignore confessional subscription, or even unrepentance, because no one really wants to deal with the problem of someone who refuses to repent, but this is truly an unchristian refusal to accept responsibility to carry out one’s duty. Tampering haphazardly with the liturgy is something we certainly want to discourage (and, at Gottesdienst we repeatedly do discourage), but what about open Communion? Allowing confessional subscription to be optional for admission to the altar? Is this the kind of “Christian” freedom in view? They do not say, but that in itself is a problem. Why don’t they say? Why “subscribe wholeheartedly” but not “unconditionally”? Imagine has it exactly backwards. They ambiguously scoff that “[u]niformity in practice seems to be a higher value than Christian freedom” (ibid.). But our synodical and District officials need to be encouraged instead to take the responsibility for uniformity in confessional subscription, and consequently pulpit and altar fellowship, seriously, and to be willing, if necessary, if nothing else avails, if all other means of arriving at a God-pleasing resolution have been exhausted, to pluck out the eye or cut off the hand that offends. This is the same thing that must apply in the congregation, when pastors are confronted with recalcitrant and repeated refusal to repent of sin. What anyone who has a position of authority must be aware of is that there sometimes arises the need to use it in a negative way. There are some kinds of freedom that are plainly sinful and must be confronted and condemned. Sometimes we must pray for the intestinal fortitude to do odious and difficult tasks, and for the wisdom requisite for doing those duties judiciously and carefully. This is even true for fathers and mothers with respect to their children; it is true for pastors who must deal with manifest and impenitent sinners, as the Catechism says. And yes, it is true for synodical officials. Here’s a pastor, or a congregation, who needs support; there is one who needs admonition. Here’s one needing instruction and encouragement; there’s one needing a stern rebuke. Let’s say there’s a congregation that wants to crucify their faithful pastor. They don’t like how he approaches his ministry differently from his predecessor. Let’s say his predecessor had had open Communion for over a decade, and now this new, perhaps young pastor is saying his conscience won’t let him do that. And let’s say the congregation threatens him with reduction in pay, makes life miserable for his family, and holds a meeting with the intention of casting him out. So, he calls the District President. This congregation would need admonition: they would need to be assured that their pastor is carrying out the duties of his office in accordance with the Lutheran Confessions, as he has vowed to do at his ordination. Perhaps they are confused, and simply in need of some outside reassurance, since they have not seen a pastor do things this way. So maybe all they would need is to have this reassurance first of all, and perhaps even some expectation that things will improve as a result. After all, putting the best construction on things would likely entail expecting that such reassurance would produce good fruit. But let’s say matters do not improve. Say the congregation continues to insist on some form of monetary or verbal persecution. Then they may well need to be warned that if they will not receive this pastor, who, they have already been assured, is faithful, there will be consequences for their behavior. They could—and perhaps should—face the possibility that unless their approach to the faithful pastor changes, they could be removed from the roster of the Synod. Districts are advisory, it is true, but they are also empowered with guardianship of their own roster. To the people at Imagine I would say: Christian freedom does not let the official off the hook here. Indeed, this is where a District President’s life becomes most difficult: he must call someone, or some people, to repentance. It’s really no different from the odious task a pastor might sometimes have, when he is confronted with a manifest and impenitent sinner who must be removed from the Christian congregation (again, as the Catechism also says). No pastor wants to say to someone who persists in impenitence that he is withholding from him the forgiveness of sins, but sometimes this difficult task must be done. So also, sometimes a District President must advise an errant congregation that they must receive a faithful pastor, and if they do they will be immeasurably blessed, and if they do not, they will not only harm their own faith, they may have to suffer consequences from the District. A District President who fails in this important task may be able to befriend a congregation, but at what expense? At the expense of betrayal of a faithful pastor. Or consider an alternate situation, in which a pastor has himself caved in to the whims of his congregation. Let’s say he has retained a practice of allowing grape juice for some of his members for the Sacrament in place of wine. The District President finds out. What should he do? The first thing, of course, is teach. He must explain why grape juice can never be used as a substitute for wine, any more than milk or Coca-Cola could be allowed. He must show the pastor that what is at stake is certainty, and no certainty can be attached to something Jesus has not commanded. Moreover, there are Protestant churches all around for whom the Holy Supper is merely symbolic anyway, so any kind of drink could be suitable, especially if it’s from grapes. This is an added reason for prohibiting altogether the use of grape juice, for it would add credence to the false idea that the Sacrament is a symbolic thing. So, let’s say the District President has carefully explained all of this, but the pastor still insists that he will continue to use grape juice. Here, as in the hypothetical case above, he may have to warn him of the possibility of consequences. A practice that is absolutely unacceptable must cease. The pastor who follows this lead will have the benefit of telling the congregation that he was required to do so by the District, and therefore perhaps some temporary fallout can be avoided while instruction ensues. But let’s say he says no. His final answer. This leaves the District President no alternative but to place him on restricted status, and if necessary, remove him from the clergy roster. Or consider a third situation: a pastor and his parish are united in their desire to practice open Communion. The District President tries to instruct, and patiently to teach, but to no avail. What does he then do? He instructs again, teaches again, but still, nothing changes. He will likely be tempted to ignore this situation. After all, no one is complaining. The pastor and his people are happy with their arrangement. The trouble is, of course, that they are not really Lutheran. If they practice open Communion, then they are making their confession the same as the Methodist relatives who pay a visit and come to the altar, believing the Supper to be merely symbolic; or the Pentecostal visitor who thinks his faith is rooted in his personal answer to the “altar call”; or the agnostic who doesn’t really know what he believes, but just wants to be included. Open altars are broad altars which do not hold fast the good confession. But this pastor and his parish disagree with this counsel, and they just want to make everyone happy, and they refuse to consider changing their practice. A District President confronted by such recalcitrance must, sadly, threaten them both with expulsion from the Synod. How difficult this must be, but how necessary! It’s easy for me to write on these things and not have to carry them out myself, but that doesn’t change the fact that discipline must be maintained for our unity in Christ to find its legitimate expression. And it happens that a District President who exercises this kind of discipline—however difficult it is—is taking seriously the admonition of our Lord: “If thine eye offend thee, pluck it out, and cast it from thee: it is better for thee to enter into life with one eye, rather than having two eyes to be cast into hell fire” (St. Matt. 18:9 KJV). Clearly Jesus did not mean this literally, for whose eye is really the cause of sin? For that matter, a similar word in the Sermon on the Mount (5:30) adds the right hand. These are quite evidently members of the body of the congregation. The full exegesis of these passages is beyond the scope of this essay; suffice it to say that while Jesus does warn against undue haste, He makes clear the importance of action in the extreme case. A District President must do the right thing, no matter how odious. The necessary thing. The thing that would likely bring hate mail, and scorn, and malice. “Jesus,” they would say, “is nice to people, but you are heartless and cruel.” This would not be true, but no matter, for it would inflict pain. Who doesn’t want to be liked? But in these days of a tumultuous Missouri Synod, what these men need is encouragement to do the right thing. And it is misguided at best, and duplicitous at worst, to say the opposite, to prattle on that the Church needs an ambiguous, phony, and sickening kind of freedom. 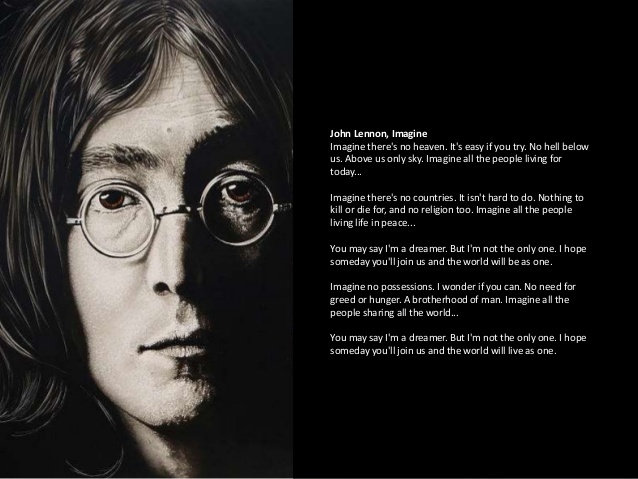 Imagine!